So following yesterday’s Azure Drake drop, we went back to kill Malygos today. We’d decided yesterday to try and split the Malygos runs the way we do the Tempest Keep runs – my main plus my hunter, and Alieth plus any of my other alts (for Tempest Keep we use my disc priest, for Malygos we’ll probably use my tankadin). This decision was taken despite the risk of having a second Azure Drake drop for the group with Alieth in it, which would be about par for the course since it would be yet another mount I would have on an alt but not on a main. After a few wipes we figured out a way to kill Malygos as a feral druid / hunter pair (pet tanks Malygos, I mostly sit and do nothing until after the third vortex, when I join in and help out on DPS to push Malygos to the phase change). 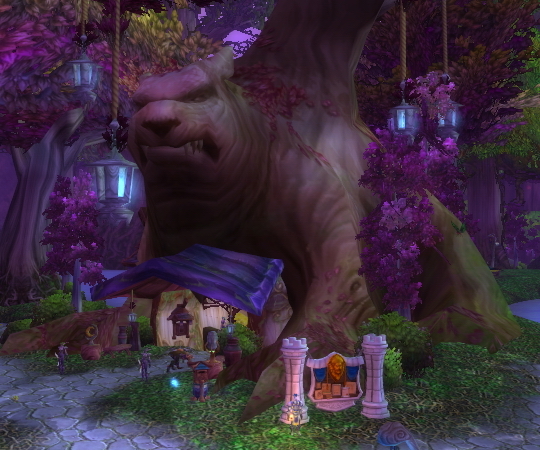 Everybody knows the Darnassus bank is under a nifty bear-shaped tree. What I had never noticed until today, when I found myself flying around in Darnassus while waiting for the Tol Barad queue to pop, is that there’s an eagle on top of the bear. God knows how I managed to go this many years without noticing it. I feel like the least observant person ever now, especially since its head is quite detailed. At least part of the reason I didn’t notice it until now probably is that to see the whole thing from the ground you have to angle your camera up and move quite far back – almost as far back as the entrance to the Temple of the Moon, in fact. Click to enlarge. I couldn't bring myself to crop this one. I’ve just never really angled my camera that far up. 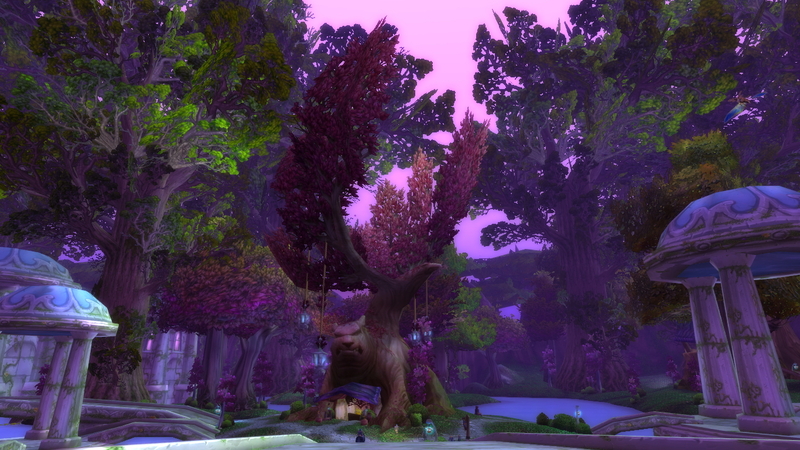 Not in Darnassus. (I did when I ran all the way to Ironforge, though, for my aquatic form quest back in vanilla – I’ll have to track down that screenshot, it’s one of the first I ever took.) And so I only noticed the bird when I literally flew into it. Have to love this game… I can still find things I never noticed before even in areas I’ve visited thousands of times. I’ve been (slowly) sifting through my various characters’ PowerAuras in preparation to converting them (as well as my NeedToKnow timers) to WeakAuras, figuring out which auras I still use and which are not worth bothering with. Looking through my paladin’s auras, I was reminded of something I’ve been meaning to post about for a while. That’s my paladin’s PowerAuras setup. The RF, seal and Holy Power auras are self-explanatory – the training wheels I’ll have to explain. …which was all well and good, except I found myself staring at my bars rather than at the fight a fair amount. Which can sort of work as a DPS, but as a tank? It’s a recipe for disaster, plain and simple. So I set up PowerAuras to display available abilities – the ones in my basic rotation, anyway – and their keybinds. That way, I never had to look away from the fight to learn what keys to press. I’ve since used the same system on other alts, to remind myself that I should use certain abilities, but my tankadin’s where it started. So I started playing again on Thursday, after being away for the first two weeks of 4.2. I’ve been mostly playing my main, but I did do dailies on multiple alts, including my tankadin. I just now remembered to put Holy Shield on my bars. At least I haven’t ran any instances, so I was the only victim of my own stupidity.